The installation process of the glass base. Welcome: Good Stair System Inc. The picture below shows the situation we shipped at the factory yesterday. 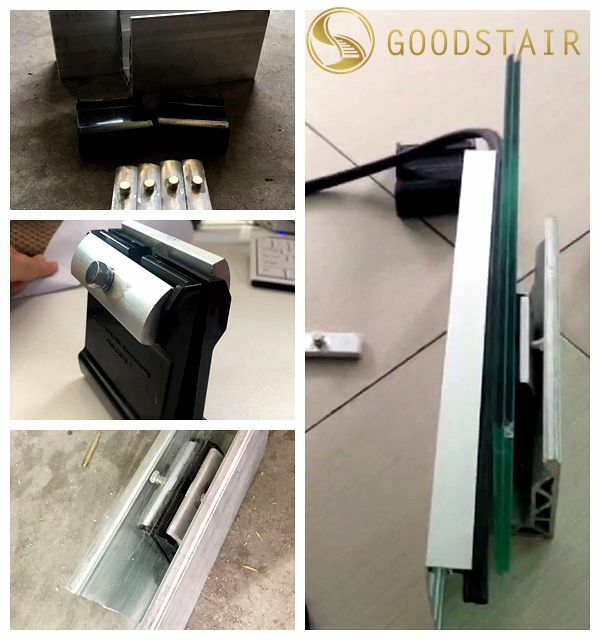 Singaporean customers purchase a 24-meter glass fence base and a U-shaped bayonet guardrail armrest at our company. We carried out a trial installation before shipping. First let the glass snap into the black clip and then attach the gadget that holds the clip. Second, place the entire clip in the aluminum bottom slot and loosen the screw. Since the screw is loosened, the top of the screw will withstand the aluminum bottom groove. The looser the screw, the smaller the gap between the clip and the glass, so that the effect of fixing the glass is achieved. If you need a detailed installation video, please contact me. I am happy to help you. Guests From The Canton Fair.